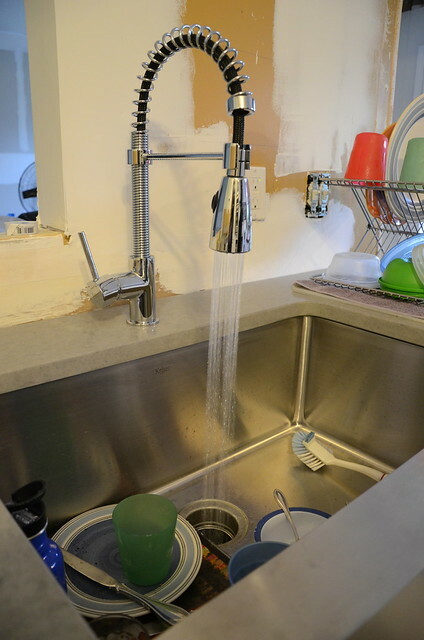 Mitch installed the faucet Monday night, but we had to wait 24 hours before we could use it. I washed my first batch of dishes in it last night. It works much better than washing dishes in the bathtub. The dishwasher still needs to be properly hooked up. It is leaking where the discharge pipe connects with the garbage disposal. Mitch should have time to fix it this weekend. I really want to get rid of the drying rack. 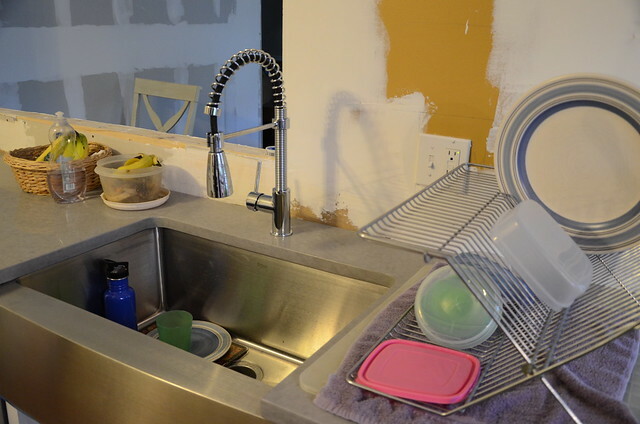 I don't want the countertop cluttered with stuff, but function might win this battle. I am intrigued by the over the sink collapsible drying racks. Anyone have a drying rack they love? How great is that sink?? It looks wonderful. We tuck our drying rack away in a cupboard when it isn't being used. Brian sometimes sets things on the stove grates to dry, but I really would NOT recommend that. You should see the nice rust spots under the caps for where the gas comes out.